Making Solar PV and Wind energy predictable is a huge challenge. There is opportunity to create a foundation for the mature adoption of Solar PV in the energy market. This description complements the project overview in the images. Our project provides the foundation, acting as a catalyst for the solar energy production industry to be able to create and use the necessary standardized predictive forecasting and economic models to reliably incorporate Solar PV into the energy production market. Our DataBase will be a platform for collaboration between the parties involved in the design and project development of solar installations as well as the distribution, sale and consumption of the energy these sites produce. Through this collaboration, the database acts as a catalyst for the solar energy production industry to be able to create and use the necessary standardized predictive forecasting models to reliable incorporate solar photovoltaics into the energy production market. 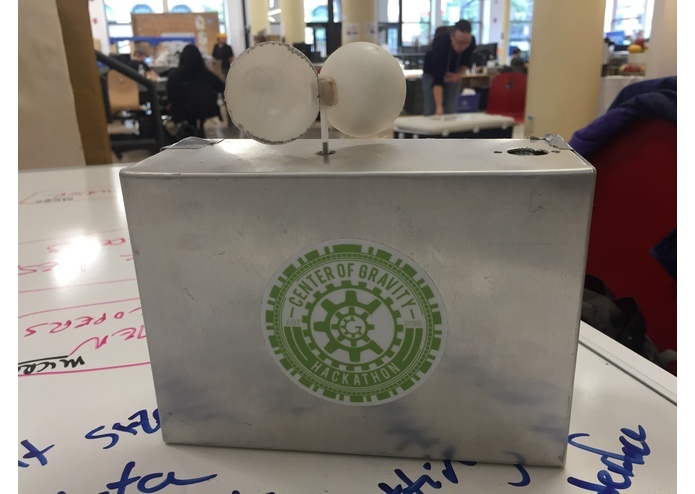 Our weather station hardware, is simple and cheap and provides a standard measurement installed with residential and commercial Solar PVs to feed real-time local weather data linked to actual solar inverter measurements into our database. By incentivizing the input of standardized data at the same time as the data in our database is shared and leveraged, the quality of predictions made of this information will continue to increase and grow. Sources of Data: 1) The initial source of data within our database will be from existing weather stations, models and satellite data. 2) As our market penetration of our weather stations increases, our standardized measurement methods and practices will feed in more and more streams of data. 3) Solar production data ideally from site that include our weather stations will be imported and tied to the most accurate source of weather and cloud cover we have for that region. This will grow through partnerships with solar installation and development teams who use our weather stations in exchange for access to our database for accurate modeling on their future installations. Our database, backed with on site weather data, will be a unified platform on which the multitude of players in the solar energy market can collaborate and more accurately predict the impact of weather on aggregated solar energy production on the stability of the grid. We broke into two teams. Hardware and software and business case. Each team worked in parallel and met up as needed and for set debriefs. It was an awesome way to question each others work and have a better final product. 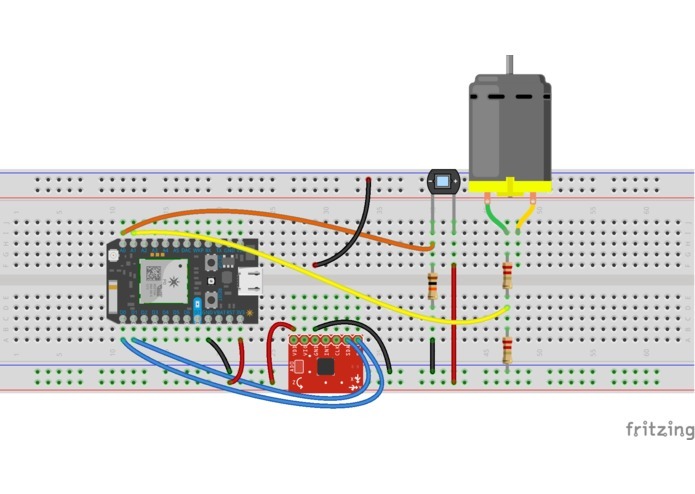 Hardware: The hardware team built a working prototype of the Micro Weather Station, and wrote code that runs on it. 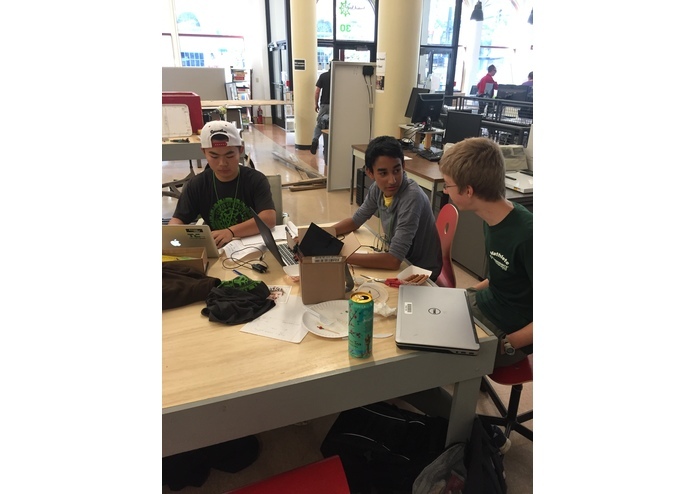 The prototype is based around a Particle Photon, a WiFi enabled Arduino-like platform. It takes in inputs from a set of different sensors that provide useful data for weather predictions. The prototype has three sensors, with the ability to easily add more. The temperature sensor gives the ambient air temperature. The anemometer, based on a small DC motor, measures wind speed based on the voltage produced by the motor. The irradiance sensor measures the current amount of light energy being received. The station takes the inputs from these three sensors, converts them into standard units, and sends these weather readings periodically to Weather Underground. Software: The software team built the program that can pulling data from the server of Weather Underground. After that, the pulled data is stored in a txt file and pop out a chart to visually show the change of the temperature, amount of solar, and speed of wind versus time. Business Case and Application: We scoped out a viable business case for bringing the hardware to market and making a sizable impact on progressing the solar energy production industry. Our business team spoke to local subject matter experts, reviewed research by key players (such as SEPA), and built out a solution that addresses the existing needs of key stakeholders. Rather than trying to throw another solution or predictive weather model into the already complex energy market or try to pair with a subset of stakeholders, who have diffuse and sometimes conflicting economic drivers, we found opportunity by taking a step back and creating an independent space to bring all of the stakeholders to a level playing field and provide a solution to their major challenges and unique value to each player. We used a white board and mapped out major stakeholders and worked on understanding their needs and connections. 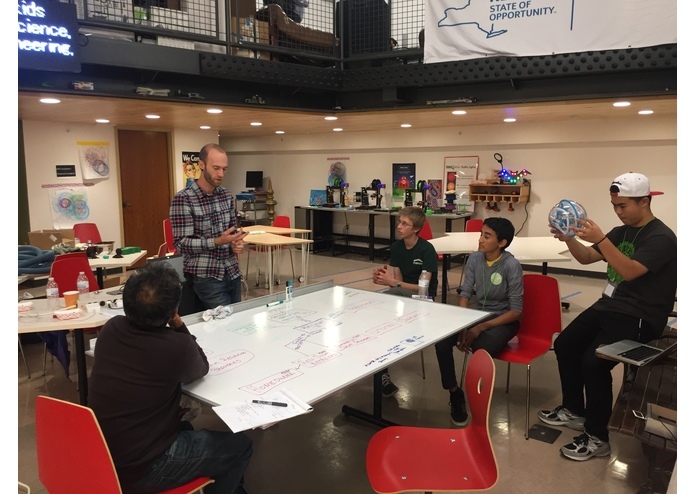 This was the foundation for our idea and in seeing the need for a common collaborative space that meets the various needs of everyone involved. We validated our thoughts against the available data we could find in the time allowed and worked through a rough outline of what would be needed for a business plan. The project presented is a solid foundation. Understanding the complexity of the existing energy market place. The lack of economic drivers to bring Solar PV ideas to reality. It was difficult to find a path through the existing complex energy systems to make positive impact on maturing adoption of Solar PV. Ideas are easy to come by, implementation of the idea is hard, but is also what sets the idea apart from the rest. That the energy market place is far more complex than what the average consumer experiences. As expected, there is a lot more work required to address barriers and mature adoption of Solar PV. 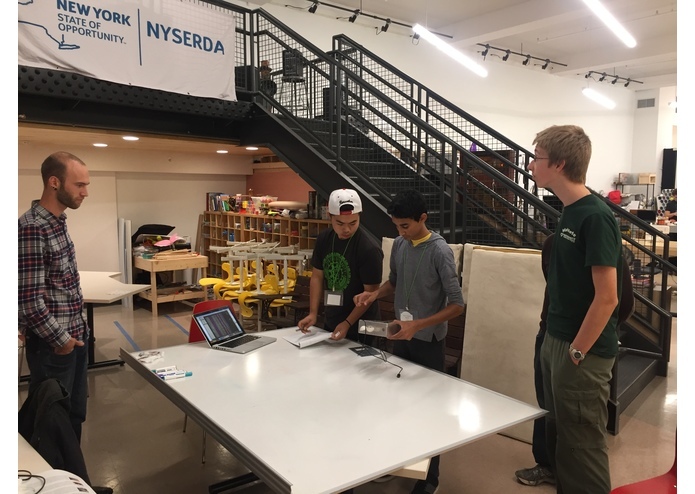 I worked with Rohan on designing and building the hardware for the Micro Weather Station. I work on the side of grabbing data from the server and analyze it in form of a chart. 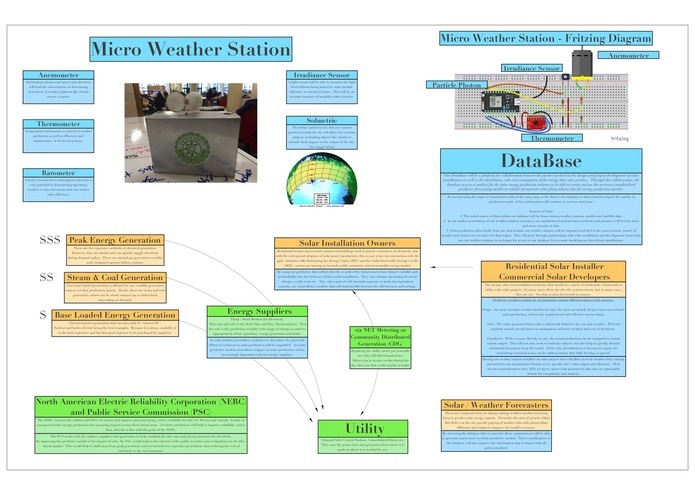 I co-developed the project business case and application for the weather station with Sam.